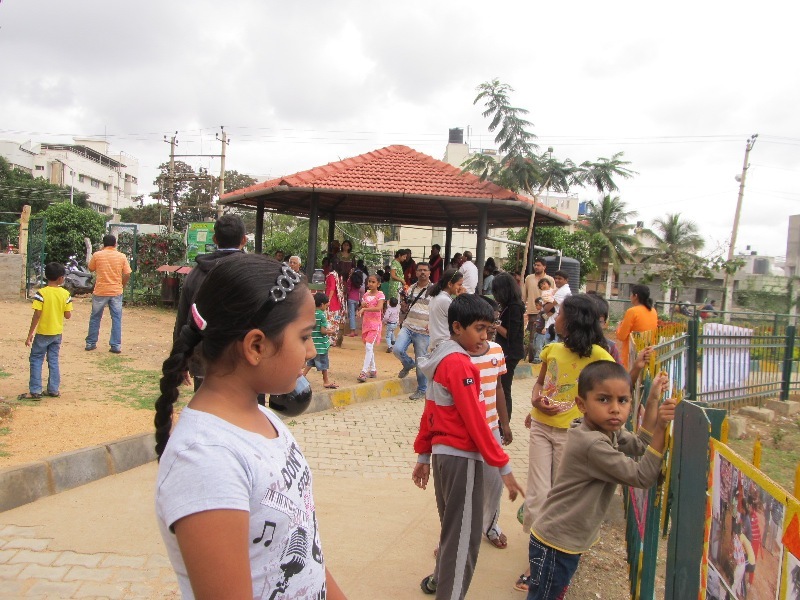 The following story was sent to us by Usha Rajagopalan from Puttenahalli Neighbourhood Lake Improvement Trust. PNLIT has been actively working with the Bruhat Bengaluru Mahanagara Palike (BBMP), towards the rejuvenation and maintenance of Puttenahalli Lake, JP Nagar 7th Phase, Bangalore. It was a magical morning at Puttenahalli Lake on 7th Sept. 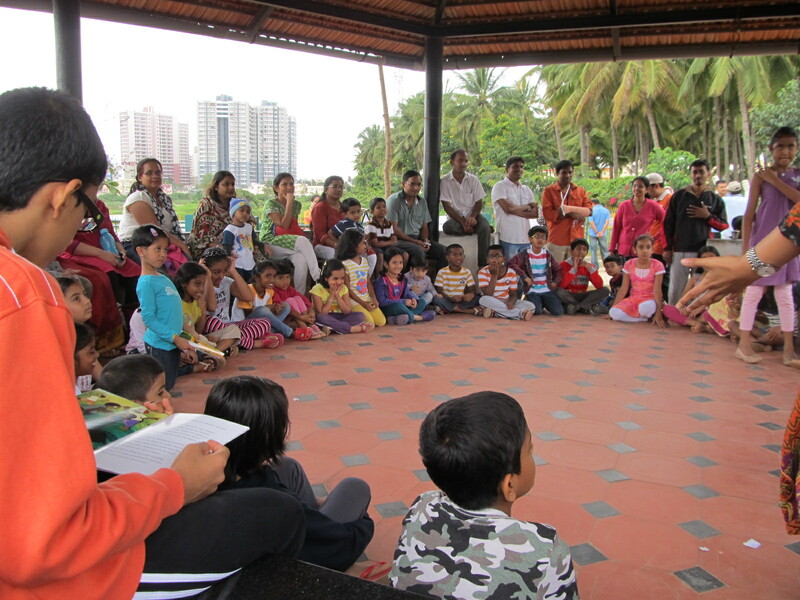 The occasion was a nation wide story telling event promoted by Pratham Books to celebrate International Literacy Day. PNLIT signed up to engage children in the locality with Surabhi Herur, a young and versatile theatre person who lives in Elita Promenade, Priya Ramakrishnan, carnatic music teacher and her daughter Sukanya a budding story teller from Brigade Millennium. The children and their parents began assembling a good half hour before the programme began and whiled the time by walking around and seeing the Coots and Cormorants in the lake. 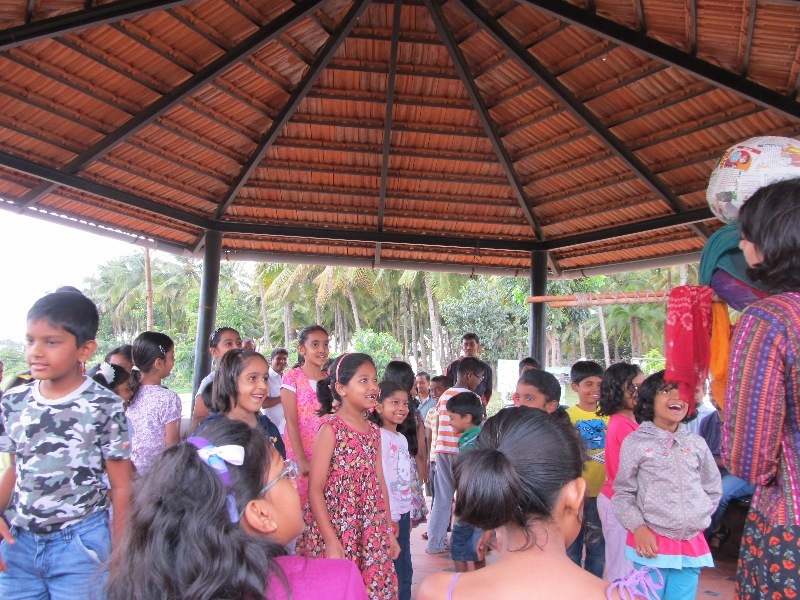 Once Surabhi began, however, no one had eyes or ears for anything except for her dramatic narration. 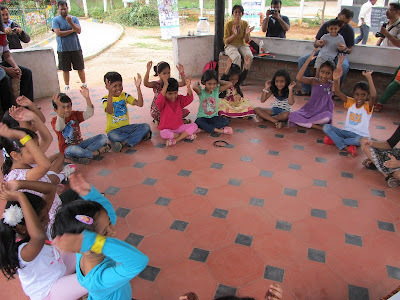 To overcome the children’s inhibitions, she got them to form a circle, walk around and say their name with a gesture/action. She and the kids then sat on the floor of the gazebo with the parents sitting on the benches all ready to hear about Paplu, a young Giant who is too kind and friendly, quite unlike others of his clan. His mother shrinks him to human size and leaves him to live with the head man in a village. One day the village is attacked by Angaar, the bandit and his men. Paplu recites the mantra which his mother had taught him and whoosh… he becomes a giant again. His clothes, however, do not grow with him. He runs and hides himself till the village tailors get together to stitch a set of clothes for him. Wearing his new colourful clothes, Paplu the Giant routs the bandits and saves the village. 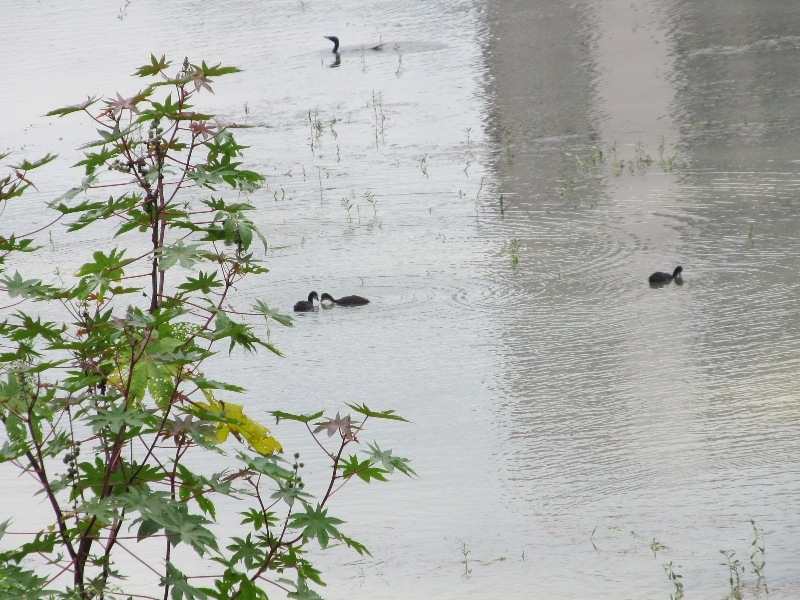 The cool breeze, the sound of traffic, the sight of birds, rippling water in the lake everything ceased to exist as each child became a Paplu in his/her mind. 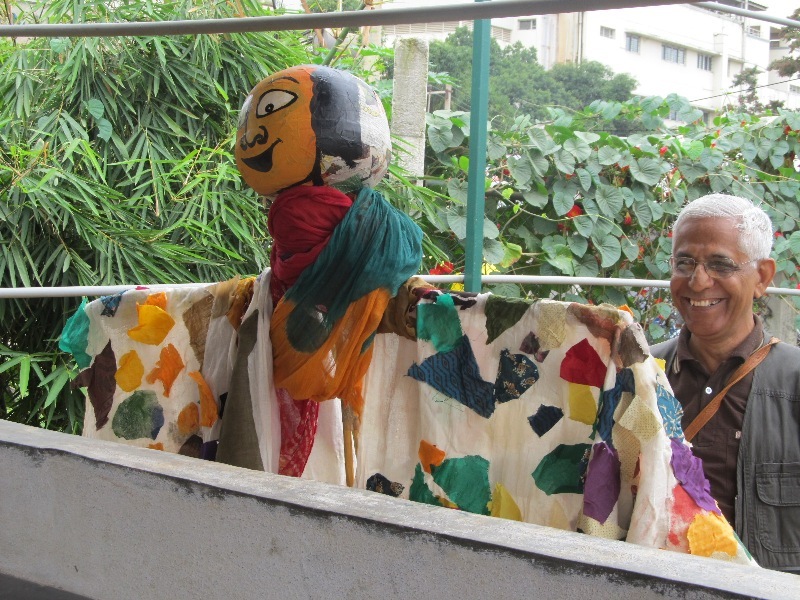 To heighten their excitement, the kids had to stick colourful pieces of cloth on a Paplu model made by the children of Snehadhara Foundation. 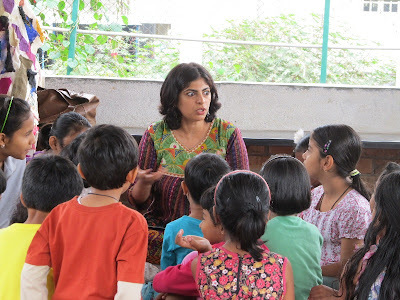 Between Surabhi and Priya – Sukanya duo, the children got to hear the story not once or twice but thrice. The early birds who came for the first session in Kannada, sat for the Hindi and by the third round in English, they pretty much knew the story by heart. The spell that Surabhi and Priya cast on the audience, young and old, was no less magical than Paplu’s mantra! When asked if they enjoyed the story and wanted another session soon, the parents were as loudly enthusiastic as their young wards! Who indeed doesn’t like a good story well told? Thank you Usha, Surabhi, Priya, Sukanya and Puttenahalli Neighbourhood Lake Improvement Trust for spreading the joy of reading!